The Tamarin prover is a state-of-the-art protocol verification tool. 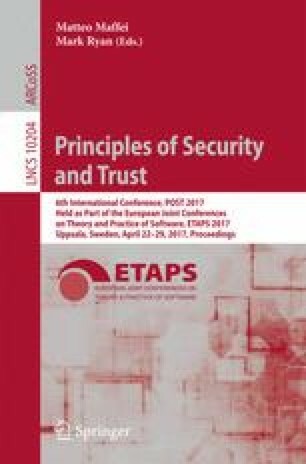 It supports verification of both trace and equivalence properties, a rich protocol specification language that includes support for global, mutable state and allows the user to specify cryptographic primitives as an arbitrary subterm convergent equational theory, in addition to several built-in theories, which include, among others, Diffie-Hellman exponentiation. In this paper, we improve the underlying theory and the tool to allow for more general user-specified equational theories: our extension supports arbitrary convergent equational theories that have the finite variant property, making Tamarin the first tool to support at the same time this large set of user-defined equational theories, protocols with global mutable state, an unbounded number of sessions, and complex security properties. We demonstrate the effectiveness of this generalization by analyzing several protocols that rely on blind signatures, trapdoor commitment schemes, and ciphertext prefixes that were previously out of scope. This work was supported by the European Research Council (ERC) under the European Union’s Horizon 2020 research and innovation program (grant agreement No. 645865-SPOOC), and by the CNRS project PEPS JCJC VESPA.